GenoMiner is a next generation sequencing data analysis computer for life science researchers with or without IT background. With GenoMiner’s easy to-use graphical interface you can analyze your sequencing data in your own lab with only 15 clicks! A wide range of standard, add-on and custom applications help you analyze and visualize data generated by Next Generation Sequencing machines. They share the same interface and have been designed to create a complete tool, serving your analysis needs from beginning to end. 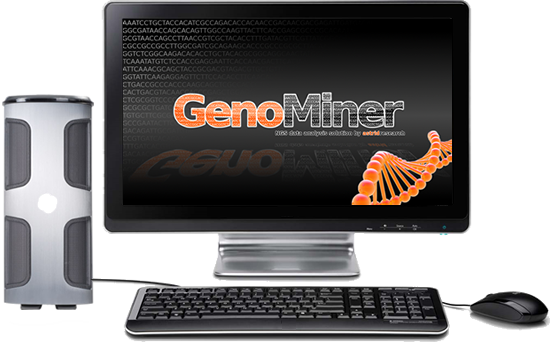 Additionally, you are able to buy the GenoMiner hardware without the software. Read more about Standard applications. Read more about Add-on applications. Our engineers can develop solutions for the special needs of your lab or research, including custom database search and integration; annotation, motif search and novel element discovery; visualization; sequence analysis and manipulation tools; complex statistics and quality control and improvement tools. With 8 terabytes of hard disk space as standard, GenoMiner provides sufficient storage capacity for all research applications. By using RAID architecture your valuable data is kept securely on the machine as long as you want it there. Data access and communication are secured and encrypted to avoid misuse of your important assets. How important is software training support in medical research? AstridBio in Leipzig for ESBB 2014! ©2016 AstridBio Technologies Inc. All rights reserved.